The former Grand Lodge of Liberia temple in Monrovia. The nation of Liberia was created in 1822 as a resettlement nation by the Society for the Colonization of Free People of Color of America, which sought to create a new African homeland for freed American slaves. The organization, first made up of mostly Quakers, believed that blacks would have a freer life away from strict U.S. laws and the still-flourishing slave trade. Later more simply known as the American Colonization Society, the society became split between sincere abolitionists, nervous Northerners who saw free blacks as a threat to jobs and property, and Southern slave owners who sought to get potential “trouble-making” free blacks out of the U.S. Nevertheless, thousands of blacks went to Liberia in search of a new life, and the colony agreed to take in captives freed from slave ships and the West Indies, as well. In its formative years, Liberia was governed by white members of the Society, but in 1842, Joseph Jenkins Roberts became the first non-white governor of the colony. In 1847, the colony declared its independence as a new, self-governing nation, and by 1867, some 13,000 had been resettled there from the U.S. The Grand Lodge of Liberia was founded by Prince Hall Masons that same year. From the beginning, Liberian society quickly developed into three classes: settlers with European-African lineage, who came to be known as Americo-Liberians; freed slaves from slave ships and the West Indies; and indigenous native people from the existing tribes already living in the territory. Liberia was dominated by a single political party for over 130 years, the True Whig Party, based in large part on the American Whigs, the precursor to the Republican Party in the years after the American Revolution and before the Civil War. The Liberian Whigs were almost entirely Americo-Liberians, and top government officials were uniformly Freemasons. By the 1970s, there were seventeen lodges at work in the country under the auspices of the Grand Lodge of Ancient Free & Accepted Masons of the Republic of Liberia, with approximately 1,000 members, and the longstanding sentiment of the tribal population was that decisions about the nation were all made secretly behind Masonic closed doors. In 1980, tribal rebels led by Sergeant Samuel Doe from the Liberian Army, staged a coup and took control of the country, after 70 people were shot by government troops during a riot over rice prices. President William R. Tolbert Jr., who was also Grand Master of the Grand Lodge of Liberia, was murdered and disemboweled in his bed, and thirteen members of the Cabinet, almost all Freemasons, were executed three days later. The fraternity was banned by the Doe regime, and it was open season on Freemasons. Many were executed, and hundreds more were imprisoned or fled the country. The descendants of the free black settlers from America were seen as a hated, elite minority, and the indigenous majority ruled the country for the first time in over 130 years. In 1985, there was talk of restarting Freemasonry in Liberia, and a special Prince Hall meeting was held in 1987 in New Orleans for the purpose of installing a new Grand Master. A Grand Convocation was held the next year in the Liberian capital of Monrovia, and gradually Freemasonry was reestablished. The once majestic grand lodge building had been ravaged by squatters over the years, but there have been hopeful plans floated occasionally to restore it. Since then, Liberia has been torn by repeated coups and civil wars, and Freemasonry in the country has continued to be persecuted. Former President Charles Taylor, one of a series of revolutionaries who held control of the country until he was ousted in 1990, was tried in 2009 for war crimes. During his trial, he made light of allowing troops to post human heads and skulls of enemies at checkpoints, saying it was no worse than the display of skulls in “Western fraternal organizations.” Civil wars have killed an estimated 250,000 Liberians out of a population of 3 million. So far. Great, but you need to do a little more research. Master Sergeant Samuel Doe, President of Liberia, was also initiated a Freemason in 1988 shortly before the Civil war and his death in 1990, making him one of several presidents who were themselves Freemasons, four of whom were Grand Masters. 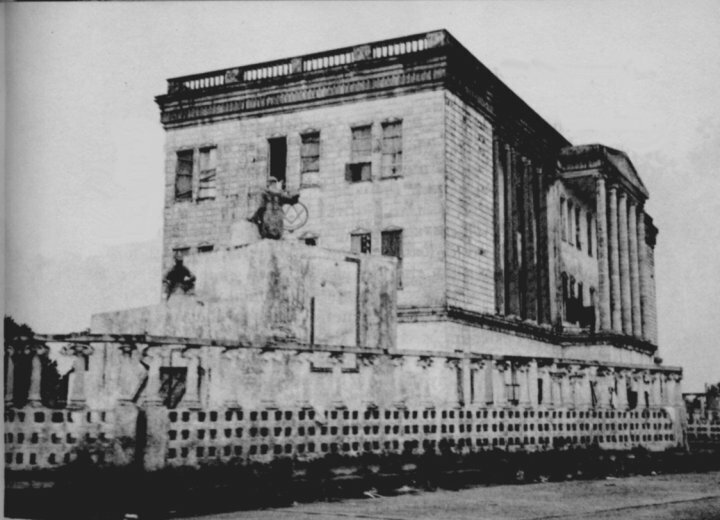 The initiation of Doe marked the beginning of the reestablishment of Freemasonry in Liberia. After a brief interruption during the Civil Conflict, Freemasonry has again reestablished it roots in Liberia and Africa with 15 Subordinate Lodges operating under the Gavel of Most Wor. Bro, James E. Pierre, Grand Master. The Immediate Past Grand Master, George Henries and the present GM are sons of two prominent Freemasons, one a Past Grand Master, Richard A. Henries, who were among the thirteen who were executed by the military junta in 1980. The Grand Lodge of Liberia is the Oldest Grand Lodge in Africa. The Grand Lodge of Nigeria is the youngest. Freemasons in Liberia come from every tribe and religious background and operate in harmony and peace. Interesting post and comments. Thanks for the additional info 'RW Bro H. A Roberts. You referred to the 1980 coup makers as rebels and the Taylor rebel forces as revolutionaries. How so? Great insight except that the thirteen (13) executed ex-officials of President Tolbert regime were killed on poles 10 days ( April 22nd,1980) after the coup and not three (3) days as mentioned..
Save Us From Ourselves. Somebody, Please. Virginia's New Academic Lodge: Patriot Lodge U.D. Masonic Plots and the Chilean Mine Rescue?